It is indeed a source of wonderment when one little sweet voice can command a stage and engage a sea of audiences. One such voice belongs to Robyn. She created a big splash in international shores with her monster hit “Do You Really Want Me (Show Respect)”. This indie-pop Swedish star will continue to make waves as she embarks on her 2019 concert tour. 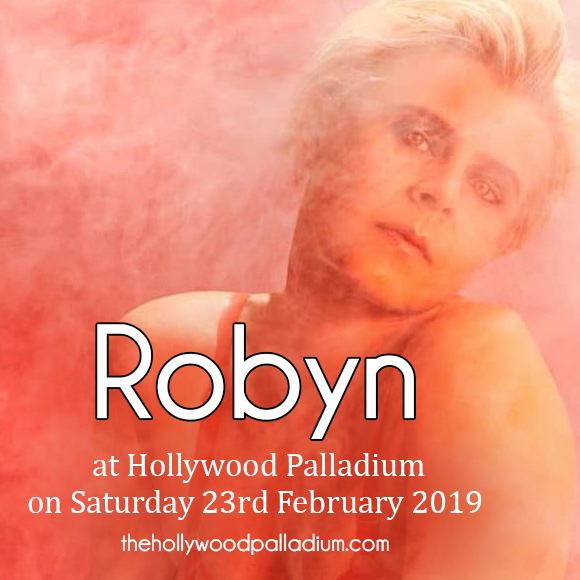 And yes, one leg of her tour will take her to the shores of Hollywood for a one-night-only show at the Hollywood Palladium on Saturday, 23rd February 2019. Delighted fans will quickly make a move to secure tickets to the show. Don't wait 'til the last minute. Catch Robyn live, before this amazing show flies away! Indie-pop singer, songwriter, and Swedish record label founder, Robyn, clearly made her presence felt and entered the room with a bang when she released her 1995 debut album, "Robyn Is Here". Her career took flight and reached dizzying heights with her debut single “You’ve Got That Somethin’” and later the Swedish breakthrough track “Do You Really Want Me (Show Respect)”, brought her flying around the globe as the song perched on numerous international hit charts. Robyn's unique voice was not only heard by music aficionados. She was also a voice actor, providing voice for animated films, including the Swedish/Norwegian film “The Journey to Meolonia” and “All Dogs Go to Heaven”. But Robyn is best seen and heard onstage where her extraordinarily sweet lilting voice gets everyone in a cheery mood, and her infectious energy makes it hard for audiences not to clap, sway, dance, and sing-along to her biggest hits. "Do You Really Want Me (Show Respect)", "Electric", "Be Mine! ", "Dancing On My Own", "Show Me Love", "Call Your Girlfriend", and "Do It Again", are just some of the many ditties that she will be performing live. Better make sure to be part of the crowd. Get your tickets now before the 'sold out' sign comes up!